This is a Chinese name; the family name is Tsien. Roger Yonchien Tsien (simplified Chinese: 钱永健; traditional Chinese: 錢永健; pinyin: Qián Yǒngjiàn; February 1, 1952 – August 24, 2016) was a Chinese-American biochemist. He was a professor of chemistry and biochemistry at the University of California, San Diego. He was awarded the 2008 Nobel Prize in Chemistry for his discovery and development of the green fluorescent protein with organic chemist Osamu Shimomura and neurobiologist Martin Chalfie. ↑ 1.0 1.1 "Roger Y. Tsien, chemist shared Nobel for tool to research Alzheimer's, dies at 64". The Washington Post. 31 August 2016. Retrieved 1 September 2016. ↑ Tsien, Roger Y. (1998). "The Green Fluorescent Protein". Annual Review of Biochemistry (Annual Reviews) 67 (1): 509–544. doi:10.1146/annurev.biochem.67.1.509. PMID 9759496. http://arjournals.annualreviews.org/doi/full/10.1146/annurev.biochem.67.1.509. ↑ Anon (2016). 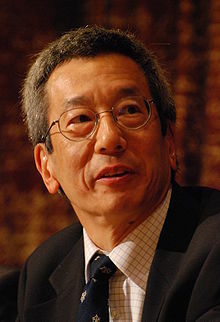 "Roger Tsien EMBO Profile". people.embo.org. Heidelberg: European Molecular Biology Organization. ↑ "钱永健研水母发光盼助治癌 (Tsien hopes jellyfish fluorescence research can help cancer therapy)". Lianhe Zaobao (in Chinese). October 3, 2008. Retrieved October 4, 2008. .
↑ "Roger Tsien at UCSD Department of Chemistry & Biochemistry". UCSD. 2008. Archived from the original (Official web page) on October 15, 2008. Retrieved November 4, 2008. ↑ "2008 Nobel Prize in Chemistry Laureates" (Official web page). The Nobel Foundation. October 8, 2008. Retrieved October 8, 2008. ↑ Tsien, Roger Y. (2010). "The 2009 Lindau Nobel Laureate Meeting: Roger Y. Tsien, Chemistry 2008". Journal of Visualized Experiments (35). doi:10.3791/1575. ISSN 1940-087X. PMC 3152217. PMID 20072108. This page was last changed on 21 October 2018, at 23:49.